Rows of cotton sash cord update a plain, painted plywood board. The look is similar to embroidery or cross-stitch, yet isn't overly difficult. We love this design for a modern bedroom where sharp lines and clean designs are at the forefront. Plus, it's an inexpensive headboard to make from a large wood board. Get the look by drilling holes in the plywood, then weaving cord through. To hang the headboard, attach D-rings to the frame and mount on screws. 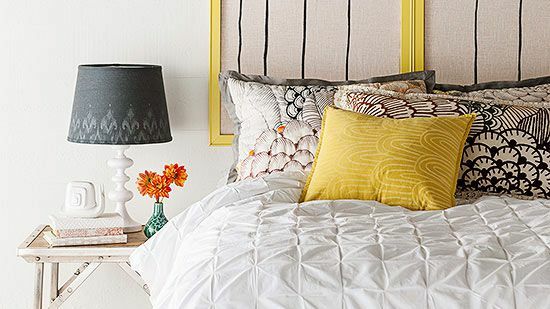 Cheap DIY headboards don't have to be complicated. 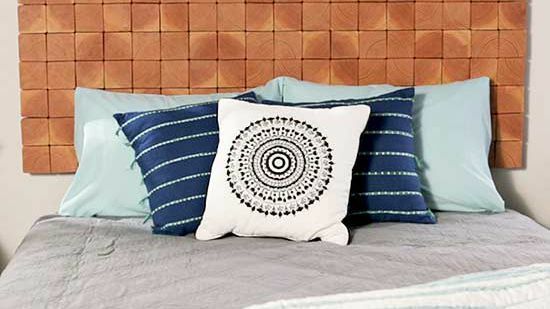 Circular cutouts keep this DIY wood headboard simple yet striking. Start with a 62x36-inch piece of plywood. Lay out circular shapes, creating desired design. Drill a pilot hole at each marked point, and saw through the hole with desired hole saw blade. Sand the edges of each hole. Cut 1-inch x 3-inch x 8-foot boards to fit the perimeter of the headboard. Attach boards on the underside of the headboard, creating a frame. This step isn't necessary, but it does add a nice dimension to the headboard. Finish by sanding the entire headboard, staining or painting it the desired shade, and hanging on the wall. Flashing is a hardware store staple, but it rarely makes its way into the home. This chic headboard changes that. With a little bit of creativity, vinyl flashing is transformed into a woven wall hanging. This cottage-chic look puts a gorgeous touch on a large piece of plywood. It's a great addition to any bedroom from a twin to a king headboard. Plus, the process is super simple. 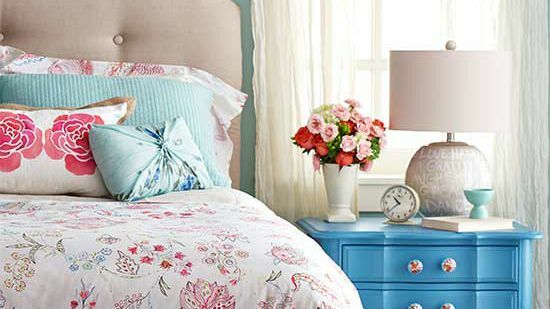 You can make this DIY headboard in only four easy-to-follow steps. One-inch-thick slices of 4x4-inch wood posts are the perfect wow-worthy addition to your bedroom. This puzzle-like piece finds interesting patterns in the natural wood grain of your posts. 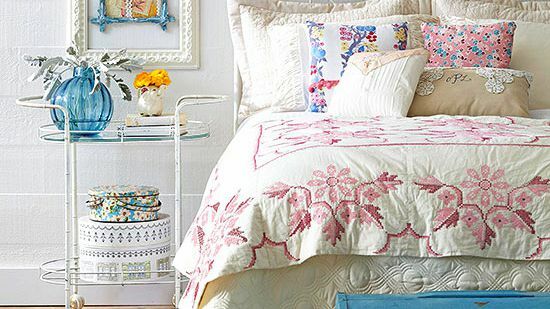 It's pieced-together design makes it a perfect fit for an eclectic bedroom. Make this eye-catching DIY wood headboard with simple materials, such as cedar posts, stain, and MDF. Our how-to shows you how to make a queen-size headboard, but this project can be adjusted to fit any mattress size. This DIY tufted headboard packs a lot of impact into a small space. The secret is to pick a bold (and budget-friendly!) fabric. This brush-stroke design acts as a piece of art just above the bed. It's perfect for a textured wall that doesn't lend itself well to hung frames or other artwork. Bedding supplies stuffed between the fabric and the headboard plywood base add an effortless upholstered feel to the piece. Fabric-covered buttons complete the tufted look. 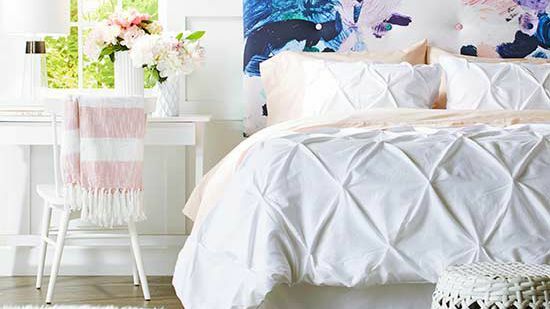 Take a fabric-covered headboard to the next level with a pleated ruffle technique. 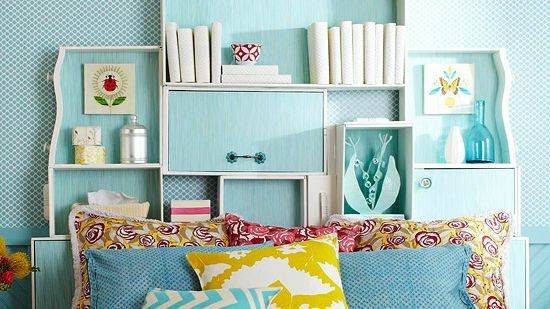 This funky design is perfect for a teen's room where innovation and creativity can run wild. 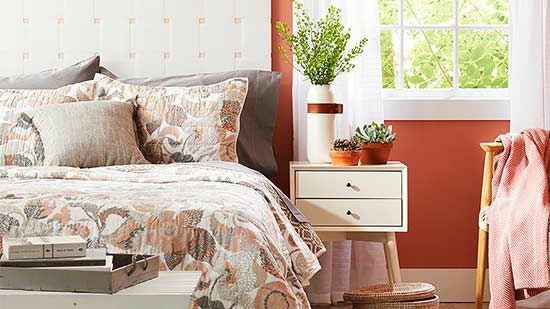 A fabric headboard is easy to personalize to match the rest of the room's decor, and you can even whip up a matching bed skirt to complete the look. To get this textured design, take a look at our helpful steps below. You'll be impressed with yourself when your work is complete. 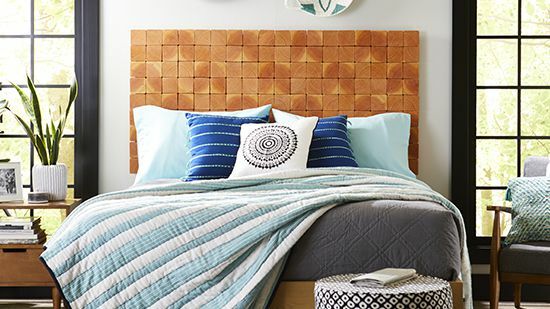 You'll be surprised by which home store staple serves as the foundation for this stylish headboard. Your guests will be impressed, too, when you tell them you made this one-of-a-kind piece all by yourself! Watch and find out what we did, plus see how easy it is to make one for your bedroom. Wood shims aren't just for builders. 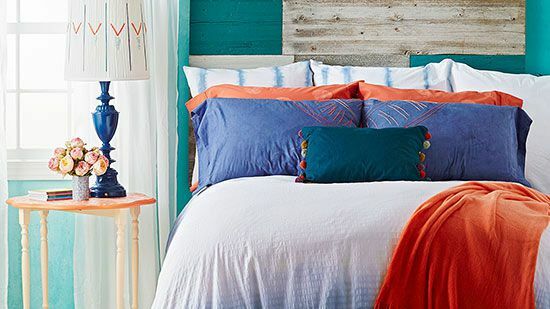 This inexpensive material is perfect for creating a one-of-a-kind, completely on-trend DIY headboard. It will match perfectly with your wood crate side table or accent pallet wall. We love the natural finish of this headboard, but you can also personalize it with a fresh coat of paint. You can also play with the design of the boards. The gridded design here is unique but simple to create. Take a look at the link below to learn how it's done. 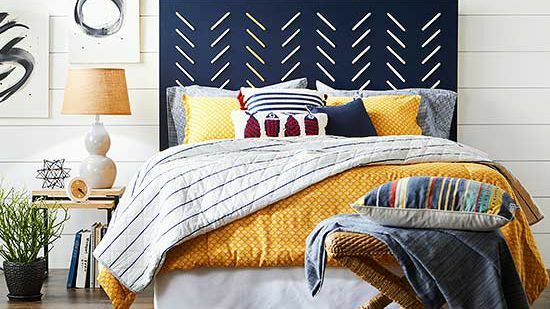 Embrace two trends—rope decor and industrial accents—with this DIY headboard. This macrame-inspired headboard would look great with many styles including eclectic, cottage, and farmhouse. Plus, it's fun to make! Put on some good tunes and settle in for an afternoon of weaving. The process is only six steps long, and the entire project can be completed in one weekend. 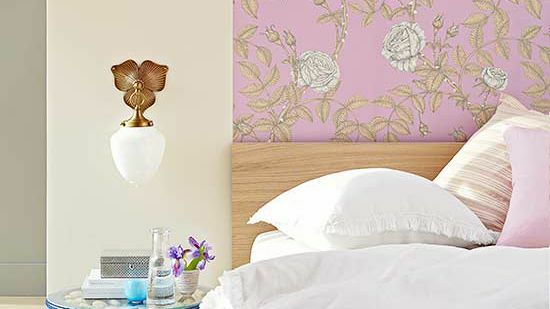 Trust us, this budget headboard is worth it. Repurpose barn boards into a new headboard with a modern twist. Cut a piece of plywood to desired size (ours fits a queen bed). Gently clean the boards with a damp cloth, but don’t scrub or sand away the weathered character. Cut boards as needed, and nail them to cover the plywood. For the whitewashed finish, we diluted 1/3 cup white paint with 1/2 cup water and brushed on the mixture. When dry, we taped off boards and created color blocks using a blue spruce hue. The soothing shade works perfectly in a bedroom, and the color blocks add a modern touch to the piece. Screw the headboard into studs in your wall, or hang with wood cleats. Look to carpet for more than just flooring purposes — use it to fabricate a headboard. Cut a pattern from kraft paper in your desired size and shape. Trace the pattern onto plywood, and cut using a jigsaw. Sand, prime, and paint the edges of the plywood using semigloss latex paint, and let dry. Place carpet tiles on the plywood, allowing them to overhang all sides of the plywood. Use adhesive caulk to secure the carpet tiles one at a time to the plywood, and let dry. Use a sharp utility knife to cut the carpet tiles to the shape of the plywood. Use a rubber mallet to nail in large nailheads 1 inch from the edge and around the sides and top. Hang the headboard at the desired height using a cleat. Editor's Tip: Place a second piece of clean, dry plywood or another heavy object on top of the carpet tiles to weigh them down as the adhesive dries. To care for the headboard, clean with a vacuum attachment to remove dust. Not all fabric headboards require you to be an expert at the sewing machine. Update an old wood headboard with a fabric slipcover and a tension shower rod. It's a super-simple way to refresh a piece you already have. This project only requires a few beginner sewing skills, so it's a great way to dip your toes in the sewing world. 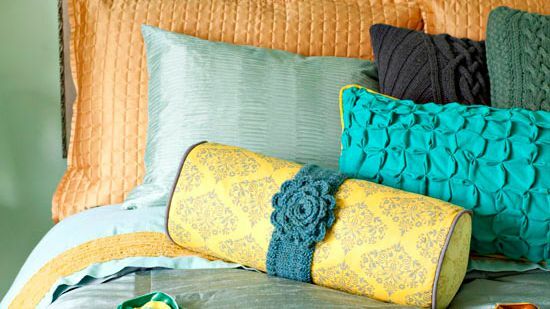 While you're at it, sew a pillowcase for an accent pillow to tie the whole bed together. If you're not finding a headboard you love in the stores, look somewhere you normally wouldn't consider for bedroom accents. Paneled doors rescued from a salvage shop can be repurposed into cheap DIY headboards. Another vintage find—a plastic place mat —created the stenciled design. 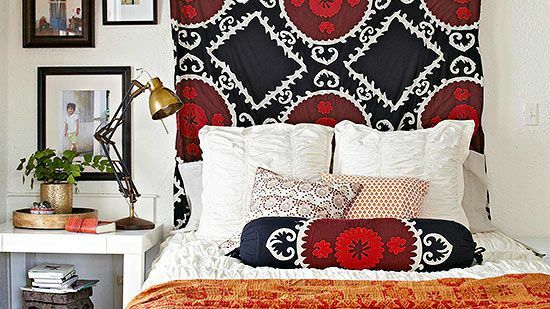 This eclectic piece looks gorgeous as a headboard and certainly brings a unique touch to the space. If you love cheap headboards, this fun project is definitely for you! 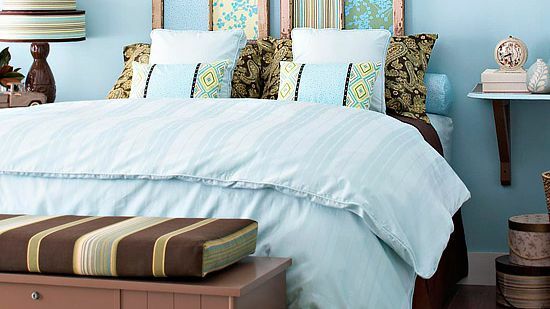 With crafts store supplies, you can make a DIY headboard that nods to a classic wrought-iron bed frame silhouette. Assemble two 36x48-inch frames from canvas stretchers. Positioned side by side, the frames will fit nicely behind a full-size bed. Paint frames and let dry. Cut two pieces of off-white linen, leaving enough material on all sides so it can be pulled tautly across the backs of the frames and stapled. Sketch half of the headboard design on each piece of linen with a pencil, and draw over the outline with a black king-size permanent marker. Lay the linen facedown on the backs of the corresponding frames. Use a staple gun to secure linen to frames. Staple the center top first; stretch the linen and staple at the bottom. Repeat for the sides. Continue stretching and stapling until linen is secure. Mount the framed canvas headboard on the wall with sawtooth hangers — two per frame — and secure with removable adhesive strips. 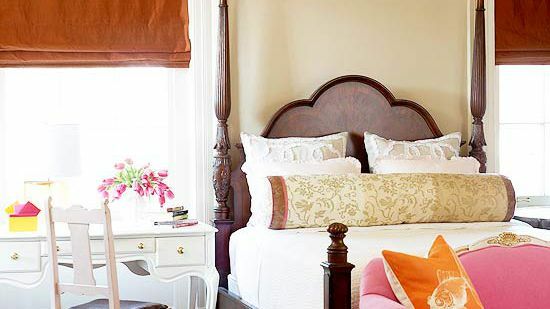 Turn old architectural elements into a stunning headboard. 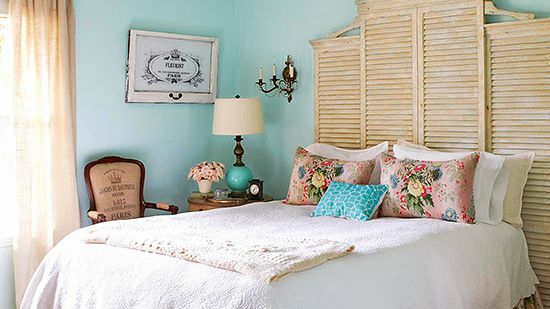 In this cottage bedroom, pairs of shutters topped with decorative moldings do the trick. 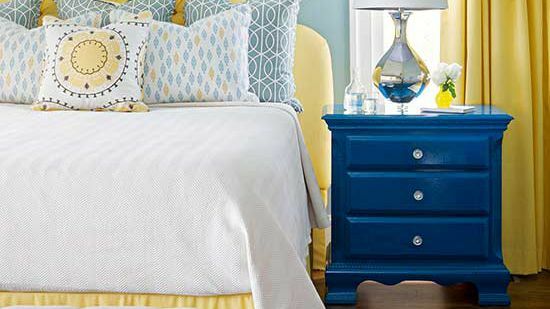 This is a great way to incorporate beloved fixtures from childhood homes or room makeovers into your bedroom. You can also give them new life with a fresh coat of paint! However, shutters, paneling, and other elements can be quite heavy—be sure to install your finds securely to the wall. 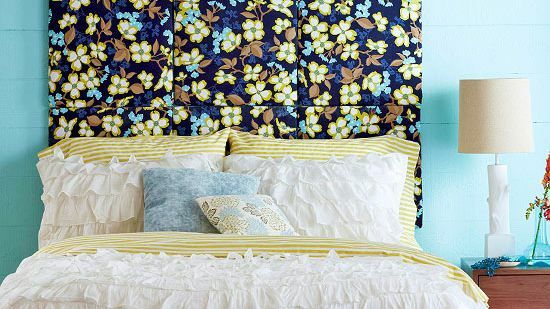 Create the look of a floor-to-ceiling headboard with wallpaper. 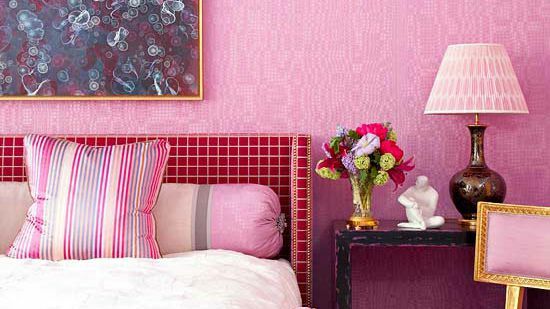 Install wallpaper just behind your bed to give the illusion of a grander headboard. This DIY look turns your entire wall into its own art piece, so you don't need to worry about dressing up the walls with extra expenses. 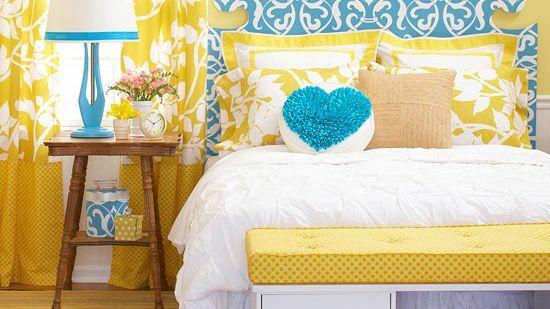 However, before you adhere the wallpaper, make sure your bed is positioned in a place you're happy with. Moving this DIY headboard is a little tricky once it's set. 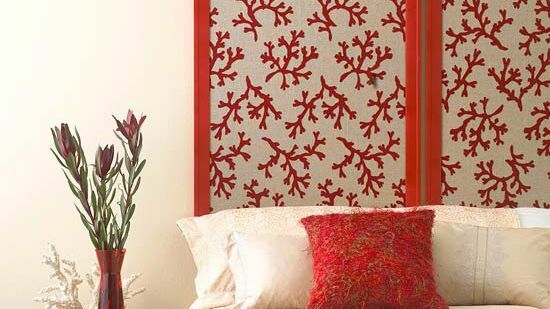 Hang fabric behind your bed for a simple DIY headboard that packs a patterned punch. 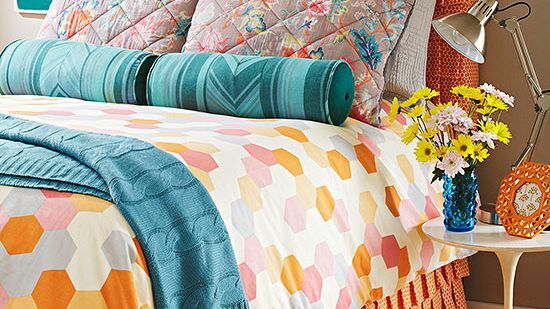 Almost any fabric will do — think vintage quilts or tapestries, drapes, or even a pretty flat sheet. The are great finds at many tropical vacation destinations. Cut and hem your chosen fabric the same width as your bed. Hang the fabric from hooks or a curtain rod. 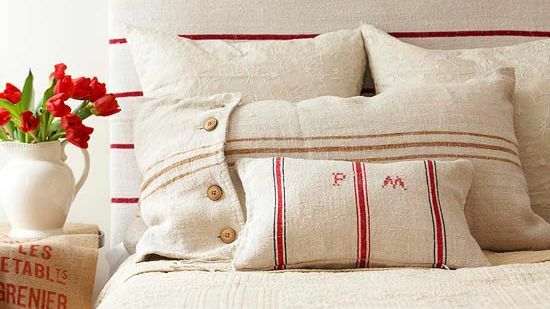 You can even use some extra fabric to sew up a slipcover for an accent pillow! It's easy to turn childhood relics and family hand-me-downs into something that grows with your family. 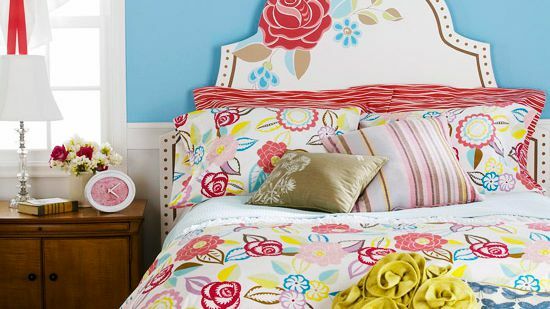 For example, with a little basic carpentry and a beautiful old quilt, you can create this charming headboard. 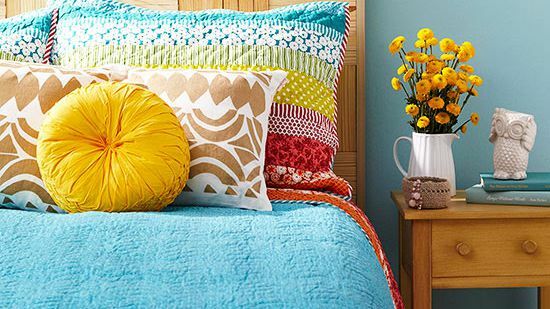 It's the perfect project for memorializing an old quilt or adding a bit of extra color to a bedroom. Follow the link below to see how we did and to see if this project could work for you. A headboard doesn't need to be expensive or complicated to make. 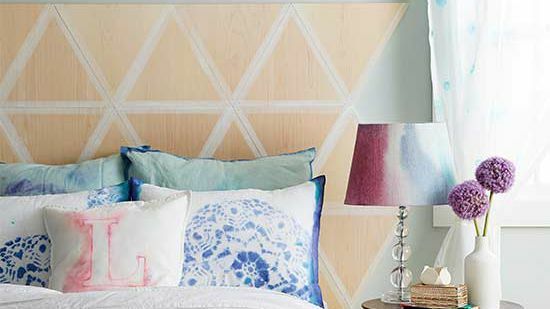 With a few tricks, you can easily create this stunning DIY headboard. The simple square shape makes the upholstery job easy. Plus, the backing is formed by two hollow-core doors. 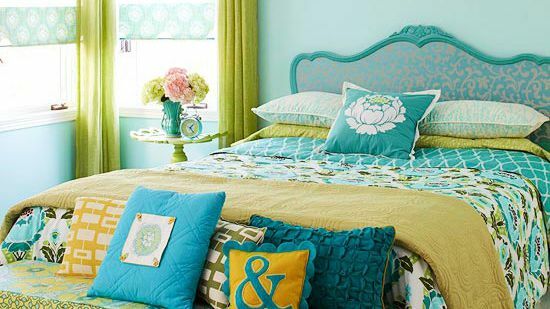 Have fun with the fabric as you choose a design that matches your walls and bedding. 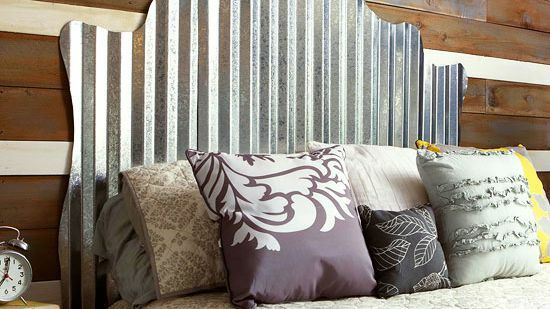 Look up for headboard materials: Use tin ceiling tiles. Cut a pattern from kraft paper in your desired size and shape. Trace the pattern onto plywood, and cut using a jigsaw. Place tin tiles on the plywood, allowing tiles to overhang. Use adhesive caulk to secure tiles one at a time to the plywood. Use tin snips to cut the tiles to the shape of the plywood. Grind down any rough edges. Paint the tin and sides, and let dry. Hang at desired height using a cleat. 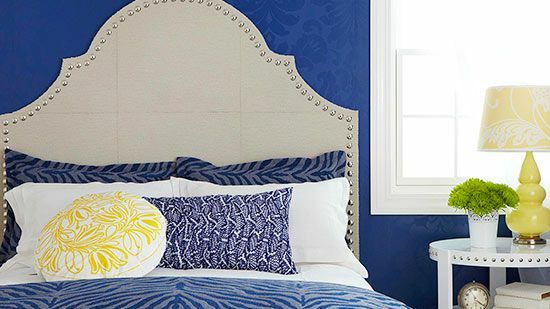 Unlikely materials are often the ticket to eye-catching headboards. Here, corrugated metal roofing was fabricated into a headboard by cutting out the shape with a jigsaw. The edges were smoothed with a grinder before the piece was screwed to the wall. The headboard falls right in line with on-trend farmhouse style decor. This will look great against a wood accent wall or paired with DIY pallet furniture. Emblazoned with the mantra "relax," this headboard gives the invitation to do just that. To build this headboard, scout out old floorboards, barnwood, or other cast-off wood from architectural salvage shops or Craigslist. Check any paint on the wood for lead (testing kits are available at home centers). Remove nails and other sharp objects, and sand well. Cut boards to desired size with a table saw. (Our boards are 60 inches long to fit a queen-size bed.) Sand the boards. Cut three 1x2s to 2 inches shorter than the height of your headboard (our headboard's total height is 40 inches, so our 1x2s are 38 inches); these are the headboard's back supports. Position salvaged boards with front sides down; place supports perpendicular to the boards. (Ideally, these supports will line up with the studs in your wall.) Screw the supports into the boards. 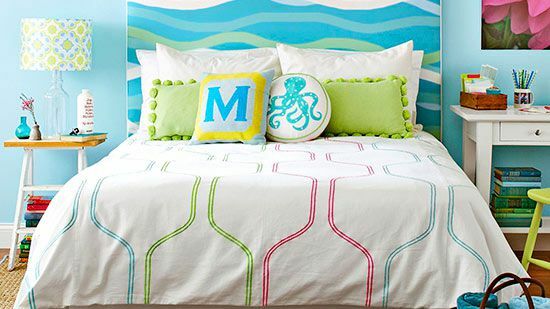 To add the stenciled embellishment, arrange your letters on the headboard and trace around them with a marker. Use crafts paint (interior latex paint also works well) to fill in the letters, covering the lines. Screw the headboard into the studs in your wall, or screw heavy-duty hangers into the 1x2s to hang the headboard. 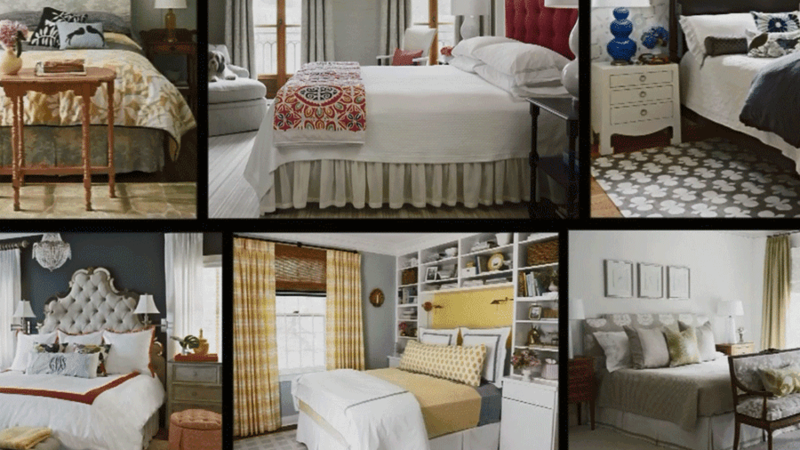 Break an oversize headboard into small squares for an easy upholstered headboard project. To make this headboard, cut plywood into enough squares to fit your space. Ours are 18-inch squares. Wrap the front of each square in quilt batting, stapling it to the back. Cut a square of fabric at least 2 inches wider (on each side) than the plywood square. Stretch the fabric over the batting, and staple it to the back of the plywood. Trim away excess fabric (especially at the corners) to make hanging easier. 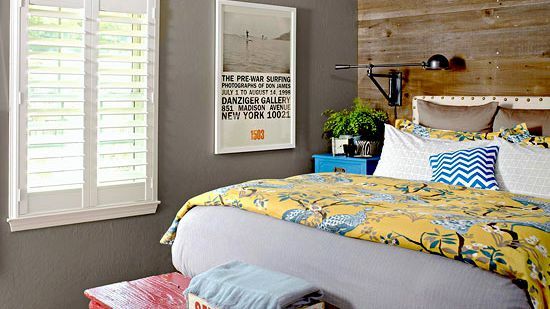 To hang, place a sawtooth picture hanger on the back of each panel, and arrange them on the wall above your bed. For less than $100, you can make a headboard out of basics from your local home center. On a piece of medium-density fiberboard (MDF), draw a design that's as wide as the mattress and about 40 inches tall; cut it out. Use wood glue to cover the MDF with a piece of beaded board cut into the same shape. Glue strips of veneer over the rough edges. Glue or screw trim to the top edge and a finial in the cutout. Paint the entire piece. When dry, mount the headboard to the wall with 1-1/2-inch spacers. Go beyond the basic headboard and make the entire wall behind your bed a headboard. Distressed barnwood planks run the length of the wall behind this bed. To create the look, measure your wall to determine what length of planks you'll need and how many it will take to cover the wall from top to bottom. Starting at the ceiling, secure the planks using nails at several points along the board, ensuring some of the nails are driven into studs. Continue down the wall, butting the top of the next board against the bottom of the previous board. You might need to cut a board horizontally when you get to the bottom. 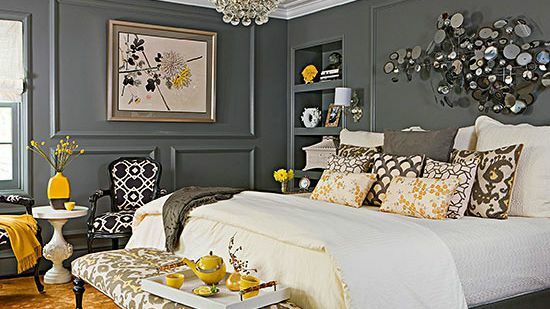 Including a regular upholstered headboard with the bed will add comfort to the wall. This no-sew, no-tools-required update is an easy and affordable way to revive a metal headboard. 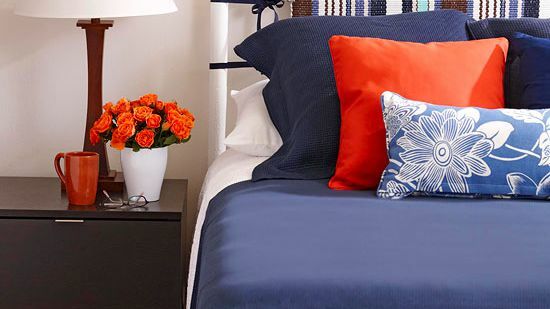 Simply drape a length of fabric —whether it's yardage, a woven floorcloth, or a blanket—over an existing headboard. Clip both sides of the fabric together with curtain rings, and loop ribbon through the rings and around the bed frame, securing with a bow. Use several curtain rings on both sides of the headboard. 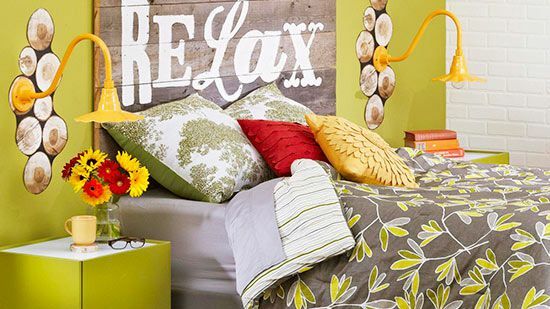 Instead of constructing a headboard, paint one on the wall behind your bed. 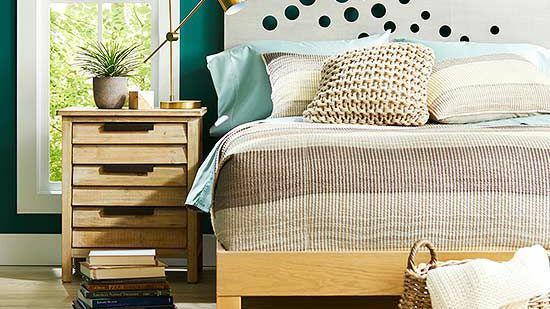 To make this faux-bois headboard, you'll need a wood-graining tool—a rubber roller that is engraved with a wood-grain pattern. Look for the tool in the paint section at a crafts store. Mask off the area where you'll be painting the headboard with painter's tape. Paint a base coat (we used a light blue); let dry. Mix 4 parts glaze medium with 1 part paint in a darker color. Apply the glaze mix using the wood-graining tool and following the manufacturer's instructions of rocking the tool back and forth as you pull it across the surface. Repeat until complete. Remove masking and let dry. Spray with a clear finishing sealer, if desired. 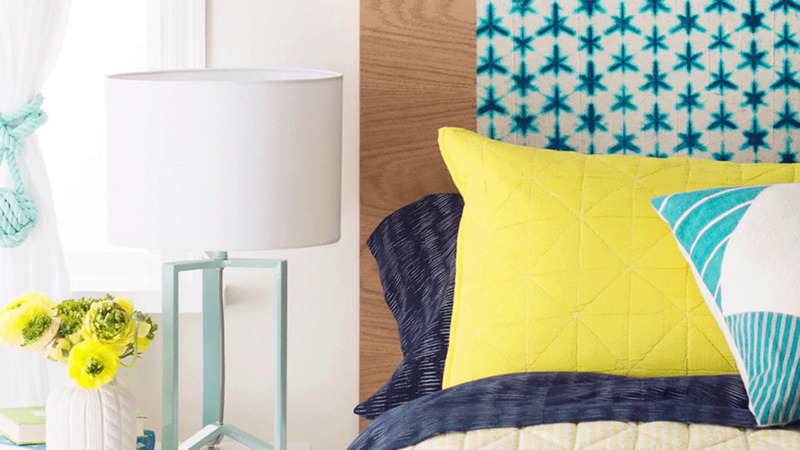 Think outside of the box while you're planning your DIY headboard. Instead of the standard rectangular shape, get inspired by the grand shapes and curves of the past. Trace a curvaceous pattern on a piece of medium-density fiberboard, and cut it out. Paint the edge white, and cover the front with wallpaper. The pattern will look striking against a blank wall, doubling as artwork in a bedroom. If using multiple pieces of wallpaper, take care to match the pattern for a chic, finished look. Add a vintage country look to your bedroom with a feed sack-covered headboard. A large feed sack provides enough fabric to cover a twin-size headboard. Staple two layers of batting over the front side of a piece of plywood, then staple the feed sack on top of the batting. Pull the fabric taut as you add staples to the center of each side and then as you work your way to the corners. For a stunning finish, nail a piece of architectural salvage to the top of the upholstered headboard. 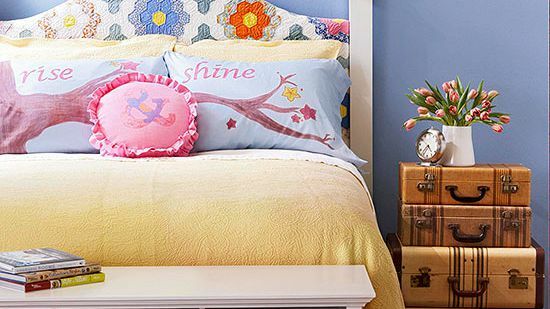 Create a one-of-a-kind headboard with built-in storage using old dresser drawers. Search salvage shops and secondhand stores for cast-off drawers and old dressers. Plan your layout on the floor, using fillers (such as storage cubes) and leaving spaces where the wall can show through. Once you've perfected your design, screw the pieces together. (We also cut plywood doors to fit a few openings and secured them with hinges.) 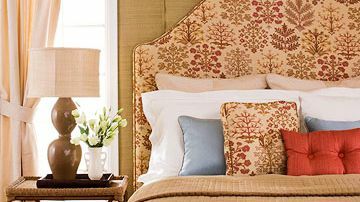 To embellish your headboard, give it a few coats of paint, and wallpaper the drawer backs and doors. Hang the headboard on the wall using a few 1x4-inch cleats. 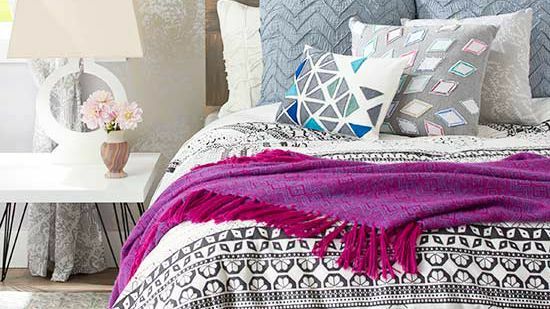 Spice up a bedroom by creating a framed headboard from a graphic print. Stretch fabric over heavy cardboard or foam-core board and secure on the back. Insert the panels into two inexpensive poster frames spray-painted a coordinating color. This modern pattern lends itself nicely to the clean white walls and bedding. 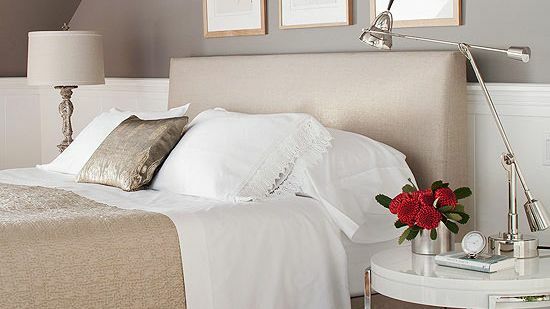 Simple decor on the nightstand continue the accented red color throughout the room. 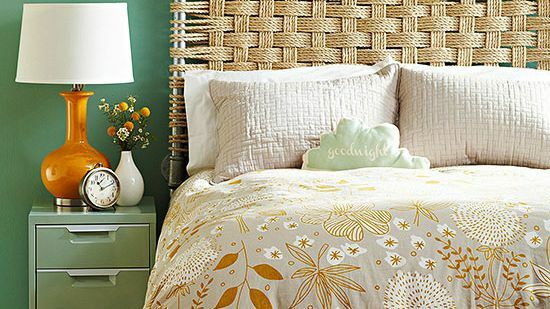 Looking for simple, inexpensive headboards? Take a trip to your local thrift shop! Scout out a large picture frame from a flea market or secondhand shop and repurpose it as a headboard. Paint the frame to match your decor. Cut a wallpaper piece to fit inside the frame. Apply the paper to the frame backing following the manufacturer's instructions. White this custom-made design features a queen headboard, it can be adapted for any bedframe size. 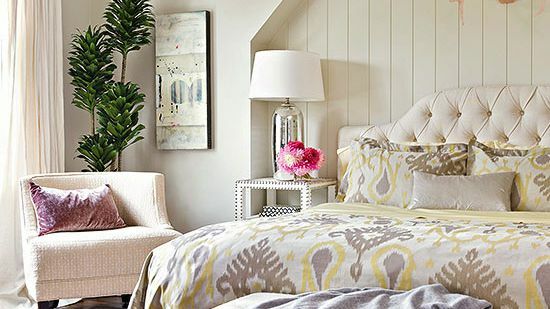 A headboard doesn't have to reach all the way to the ground. You can easily craft a headboard from object you already have and hang them at mattress height to look like a traditional headboard. 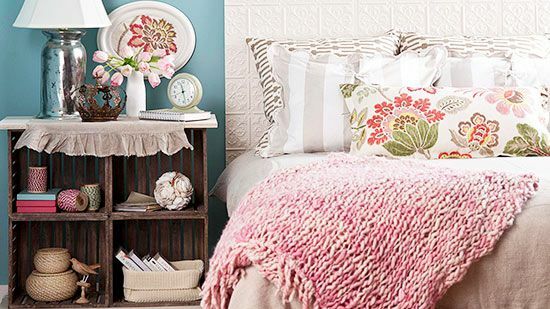 Here, we turned home center shutters into a one-of-a-kind DIY headboard. 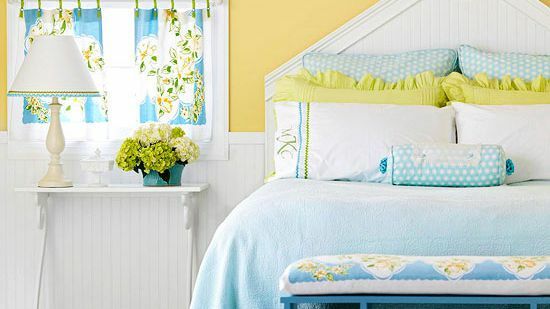 We painted the shutters to match the room's color scheme, and choose a coordinating fabric. Upcycled furniture has never looked better! With a bit of sewing skills, this high-end designer look-alike headboard can be created in a weekend. The shapely top is a nod to traditional furniture styles while the fun, bright fabric gives it a welcoming feel. Detail such as a nail head trim make all the difference in projects like this. 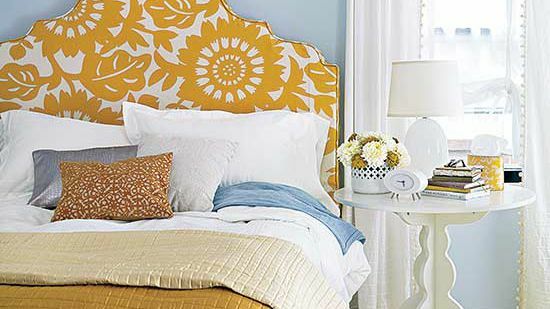 Check out our step-by-step instructions for creating this beautiful headboard. Inexpensive picture frames can be found at garage sales or thrift shops and made into a magnificent headboard. Remove the glass from the frames, and cut quilt batting the same size as the frame back. Cut fabric to size, adding 2 inches on each side. Lay the fabric facedown, center the batting on the fabric, and add the frame back. Wrap the fabric and secure to the frame back with duct tape. Insert into the frame. 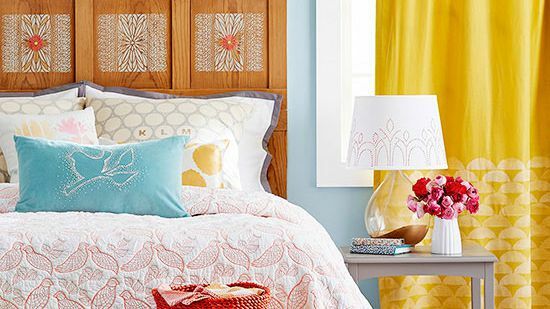 Hang the frames side by side for a picture-perfect headboard. A solid-pine door makes a perfect bold headboard. 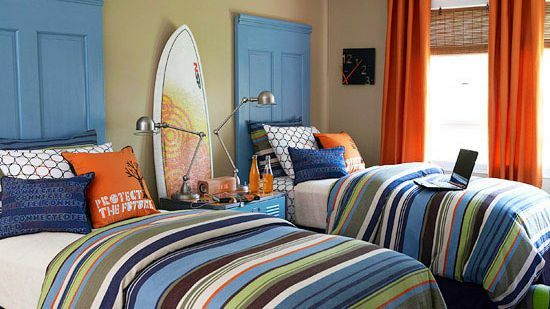 Set vertically, most doors are wide enough to fit a twin bed, but hung horizontally, doors can stretch across like a queen or king headboard. Cut 15 inches off the bottom of the door. Paint the door and let dry. Mount the door to the wall about 4 inches above the floor using two brackets. Reinforce with one bracket on top. To hide the top bracket, use finishing nails to attach a piece of molding to its top edge, 1 inch above the door. Fill holes with wood filler. Sand and paint. When you get creative, anything can be a headboard. 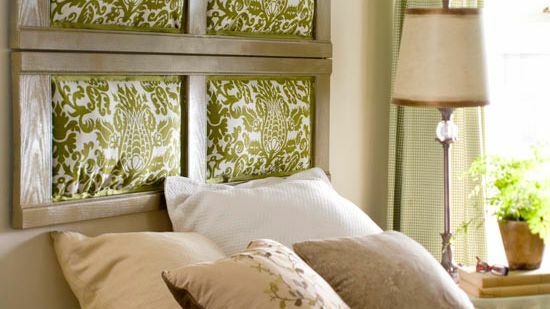 Two single window panels are the perfect alternative to an ordinary headboard. Plus, this design is perfect for a famhouse style home. 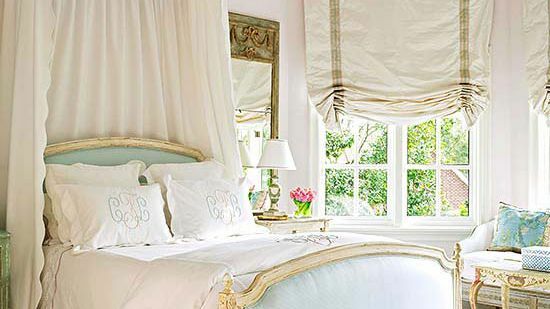 To get this look, find windows that measure about the width of your mattress. Remove the glass and install fiberboard or thin plywood over the back for safety. Cut fabric to fit each section, and secure it in place with spray adhesive.